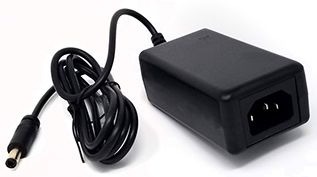 GlobTek’s GTM96180 series of external tabletop/desktop power supplies offer up to 18w of power while offering compliance to the latest ITE, Medical, Household, and Efficiency requirements. GlobTek’s 18W Single output power supplies have 6 basic model options within the 5-7Vdc 3.6A 18W, 7.1-11Vdc 2.53A 18W, 11.1-17.9Vdc 1.62A , 18-30Vdc 1.0A 18W, 30.1-38Vdc 0.60A 18W, 38.1-48Vdc 0.47A 18W. Voltages in between are available in 0.1V increments. The power supply operates at up to 85-264VAC or 110-370VDC input at 47-63 Hz. The Power supply family is rated 0°C to 40°C ambient temperature with full load and up to 80°C with derating. It offers over current, over voltage, and over temperature protection as standard. The family is available in compact low profile and high impact desktop configuration with 4 options for IEC input power inlets: IEC60320 C6, C8, C14, and C18 with a polycarbonate housing size (L)87x(W)47x(H)32mm. Alternately it is available in a wall plug in changeable blade housing with plug options for North America/Japan, Europe, Australia/New Zealand, United Kingdom, Korea, Argentina, India, Brazil, and South Africa. The wall plug in changeable blade housing is a high impact polycarbonate with size (L)74*(W)43.5*(H)36.8. Both grounded and un-grounded double insulated configurations are available for the desktop and only un-grounded are available for the wall plug in. Typical applications for the GTM96180 series of power supplies are Medical patient monitoring equipment, Medical and Dental therapy, Test and Measurement, Communications, and a wide range of industrial and commercial applications.